100 Runs In 3 Overs: Greatest Cricket Innings Ever? | The International Cricket Hall of Fame. Home » Blog » 100 Runs In 3 Overs: Greatest Cricket Innings Ever? It’s Saturday 2 November 1931, and Don Bradman steps out onto the wicket. The next three overs see him amass 100 runs. That’s right. 100 runs in 3 overs. Of course back then, there were 8 balls to an over, but none the less, it was a remarkable feat. The match was played in the Blue Mountains town of Blackheath between a Blackheath XI and a Lithgow XI to commemorate the opening of the Blackheath wicket. Bradman and his New South Wales teammate Oscar Wendell-Bill were guests of the Blackheath Team. In total, Bradman made 256 including 14 sixes and 29 fours. Midway through the innings Lithgow brought on Bill Black, who had bowled Bradman for 52 in a Kippax XI match at Lithgow in September, 1931. 3rd Over 1 6 6 1 1 4 4 6 (27) & 2 to Wendell Bill. At the conclusion of the match the Blackheath’s Mayor Peter Sutton asked if he could keep the bat as a memento. Bradman replied by saying that he could have it when he was finished using it. Some months later the bat arrived with a letter from Don Bradman asking him to receive it as a gift as promised. The undated letter also mentioned that ‘I broke (the bat) at Callen Park last Tuesday’. As Bradman played at Callen Park Mental Hospital on Tuesday 19 January, 1932 we can be sure that the bat was sent to Blackheath soon after this game. As Bradman had played several major test and first-class innings between those dates including, 135 for NSW v South Africa 13.11.1931, 226 for Australia v South Africa 27.11.1931, 219 for NSW v South Africa, 112 for Australia v South Africa 18.12.1931 and 167 for Australia v South Africa31.12.1931, it is intriguing to think that this bat may have also been used in some or all of those innings. 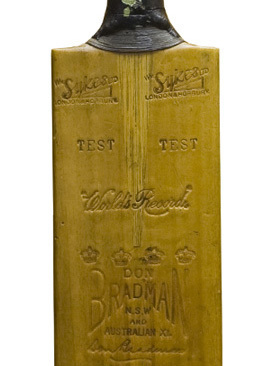 A clear favourite of Bradman, the Sykes, 4 crown “Don Bradman Autograph” bat is in excellent condition for its age and bears the split from toe to mid-blade that forced Bradman to relinquish it. For many years the bat was held in safe-keeping by the Sutton family and it survived a burglary of the family home in the mid-1950s. Peter’s daughter Nancy loaned the bat to the Blackheath Bowling Club where it was displayed for many years. The Bowling Club was taken over by the Katoomba RSL transferred it to us to enable the visiting public to enjoy this unique cricket story. The Museum wishes to acknowledge the support of Mr David Cassidy of the Katoomba RSL Club and also the support of Mr Ian Foulsham and Mr Jack Burrows of Blackheath. **The Quickest, the Brightest and the Best – Bradman’s Fabulous Century by John Boyd, Blackheath, 1980.